CALBAYOG CITY – The Rotary Club of Calbayog welcomes the district-wide celebration of the Rotary New Year 2018-2019 with a blast by celebrating it with the residents of five barangays namely San Jose, Langoyon, Canjumadac, Canjumadac, Tanval and Gelino, all located in the hinterland parts of Calbayog City, Samar on July 1, 2018. The farthest recipient village amongst is 30.5 kilometers away from Calbayog City proper. With the Rotary International’s Year 2018-2019 theme, Be the Inspiration, and RI District 3860’s theme, One Rotary, One District, the Club initiated a “4-in-1” Outreach Program – Dental Health Care Services initiated by Rotarian Dentists, Dr. Ellery Daguman and Dr. Zandro Daguman, Educational Assistance through distribution of 431 pairs of slippers to recipient pupils of elementary schools of the said villages, Livelihood Program from which 400 packs of vegetable seeds (okra and eggplant) are distributed promoting backyard farming to the local farmers, Mother and Child Program headed by Rotarian Midwife Vivian Jumagdao by conducting check-up and providing vitamins to pregnant women and feeding activity to more or less 700 people on site. RC Calbayog tapped the People’s Outreach Program (POP), Kalipayan-Katitirok-Kasangkayan (KKK), and Boleros Basketball Club in implementing the aforementioned programs to promote involvement of other civic and non-profit organizations in the community, inspire people to become ambassadors of goodwill, and enliven the spirit of brotherhood. Present during the activity to provide safety to the partakers are the men in uniform of the Philippine Army (PA) and Philippine National Police (PNP), and some teachers and school heads of the Department of Education -Schools Division of Calbayog City. Beneficiaries are converged at LSJ Farm and Puno ng Buhay Eco-Farm, Brgy. San Jose, Happy Valley, this city. San Jose is a 14 kilometer-village away from the town. 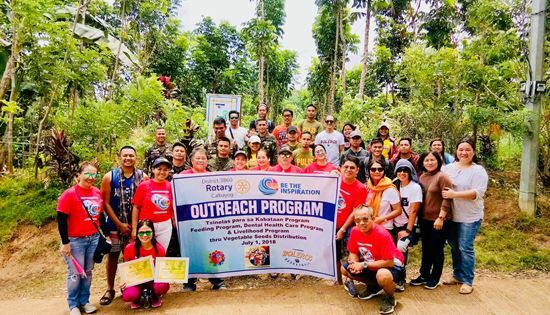 The activity concluded with the happy smiles of the children and parents as they bid goodbye to the Rotarians and volunteers before they are transported to the farthest concreted road at Sitio Tagungtong which is approximately 2 kilometers away from the venue. Rotary Club of Calbayog facilitated the said activity to bring its services and programs to the people in the hinterlands of Calbayog City and to inspire them to get involved in the activities that will promote economic development to their respective barangays by transporting their farm produce to the city.